CYP HDBaseT Splitter 1x8. 1x HDMI Input, 1x HDMI Output, 7x HDBaseT up to 100m Outputs with PoE/LAN. 4K2K Resolution & 3D Support. 2-Way IR control. The HDMI over HDMI CAT5e/6/6A Splitter can split and distribute a single HDMI input, 2-way IR control and LAN serving to up to seven CAT5e/6/6A outputs and includes a simultaneous HDMI bypass output. HDMI over HDMI CAT5e/6/6A Splitter supports resolutions up to 1080p Full HD, 4K2K timing, 3D and multichannel digital audio formats (such as LPCM 7.1CH, Dolby TrueHD, Dolby Digital Plus and DTS-HD). The HDMI bypass output can be connected to an HDMI display or cascaded to another splitter. 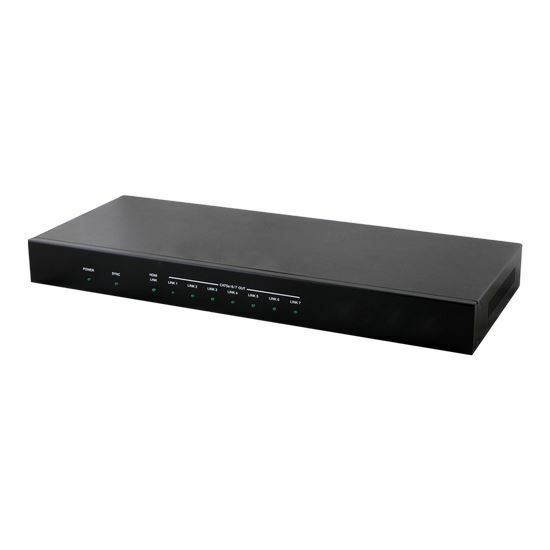 The CAT5e/6/6A outputs can be connected to CAT5e/6/6A to HDMI receivers to extend the operating distance up to 100m. Additionally, the LAN connectivity will allow a 100BaseT network to be served to smart TVs or games consoles. Power over Ethernet (PoE) function can power compatible receivers, providing greater flexibility in installations.